I have had my siegeshakers painted for a week or two now, but need batteries for my damned camera (originally typed cameras for my battery!). I need to get photos up of my models! Painted the Siegeshaker and the spare! 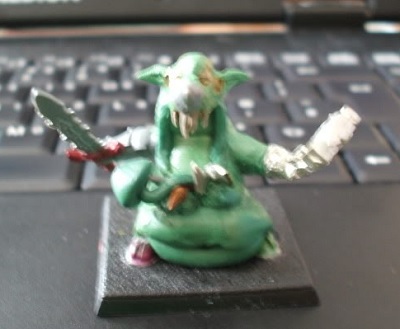 I also started a conversion for a CD sorcerer today. 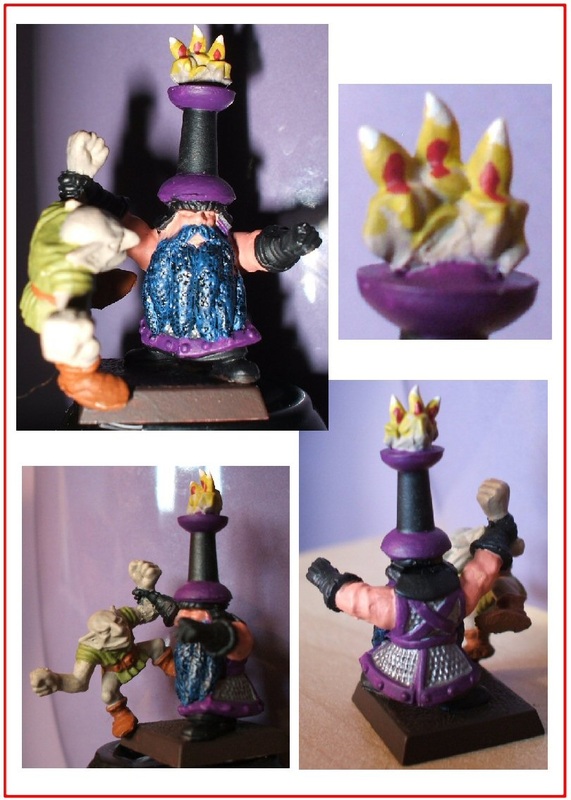 I used an old Dwarf cannon crewman (the one holding a cannonball) and cut his helm off. I took one of my 7 BBs (I was scared to do this, but will get some more hopefully) and removed is hat. Glued the hat on and now need to get some GS to fill the hole in his head, "regrow" some hair and put flames on his... urmm.. ball. Oh the hilarity of immaturity, he he he. Pics as soon as I get the batteries! Please note, it'll be the first time I have EVER used GS. Flames sounds a bit ambitious, but if worse comes to worst, I can remove them again! P.S. The hatless BB did not suffer in vain. 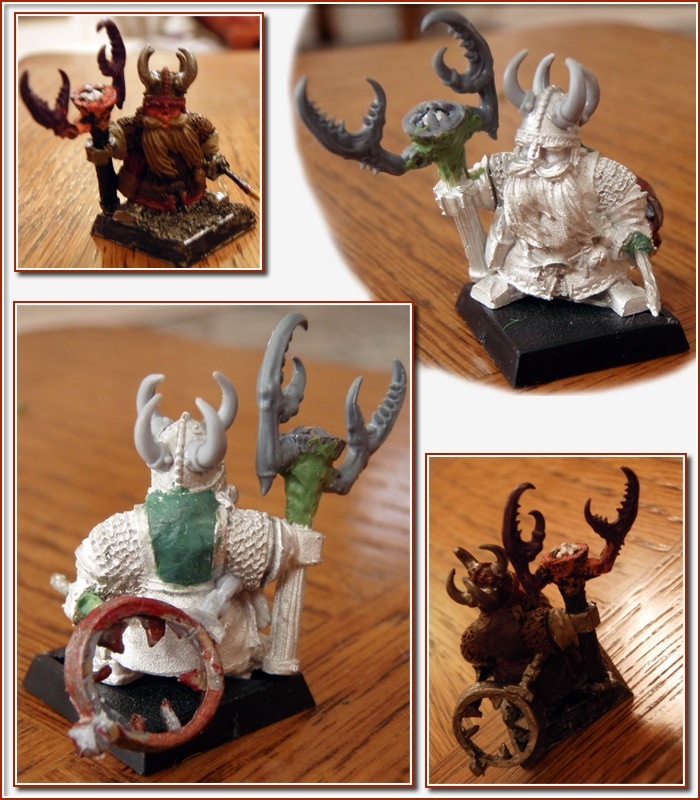 I used the spare helm from the Dwarf battalion box set cannon to replace half his head. He shall be used a unit champion or an engineer or something. Not quite sure yet. This post was last modified: 08-10-2017 01:09 PM by Admiral. So, I got some batteries, took the pictures and loaded them to my computer. Was about to start uploading them to photobucket, but my girlfriend arrived. It is now 3am and I am trying to put them on here, just for you lot! 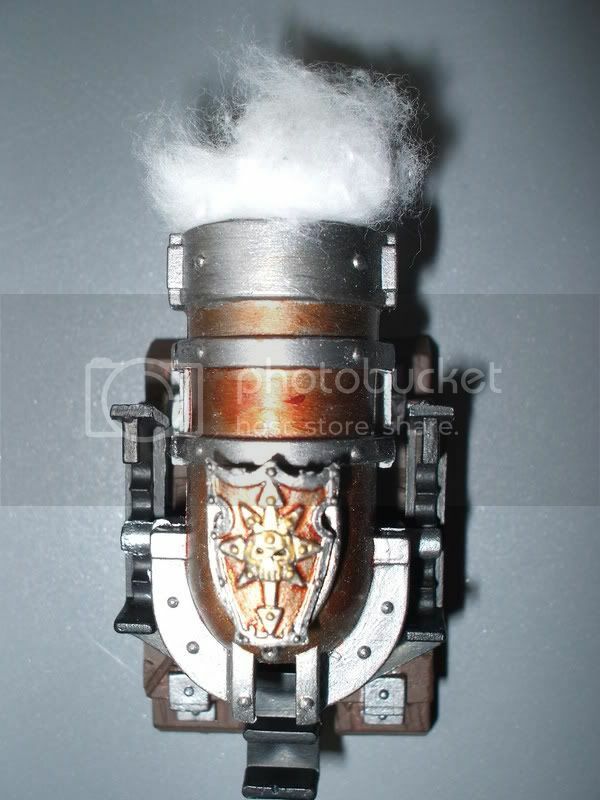 First of all, we have the main Siegeshaker cannon that I received from Mr. Xander. It shall be used as an Earthshaker or if in a Dwarf army, a Grudgethrower. I have a few slight modifications left and those are to put "gripping spikes" on the front wheels and to put some kind of decoration on them. They look too bland right now and I don't want to use more Chaos stuff if possible. Any ideas? Next, we have the second Siegeshaker that I received. This time, I did not put it on wheels and didn't include the front rim, but chose to place some cotton wool in the barrel as an explosion. In games, this will count as a Death Rocket and sometimes as an Earthshaker. The only extra difference here, is that the barrel faces the opposite direction to the chassis (when compared to the other cannon) and there was no insignia. I choce to cover the shield shaped part with a spare old Chaos Warrior shield. Which way around do the bronzeish colour and silverish colour look? 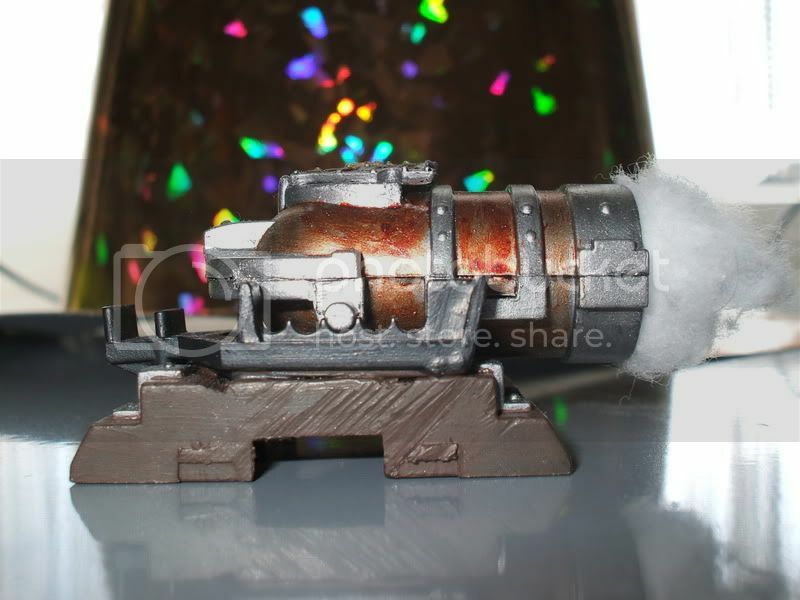 Thirdly, we have the OLD Dwarf cannon. 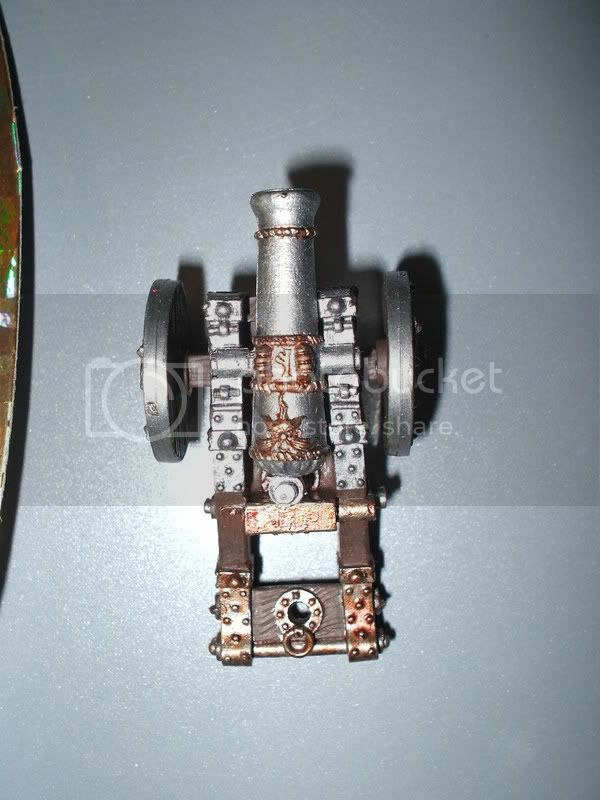 Since it is SUCH a small calibre piece of equipment compared to the other pieces, in games, it will be used as a Bolt Thrower. 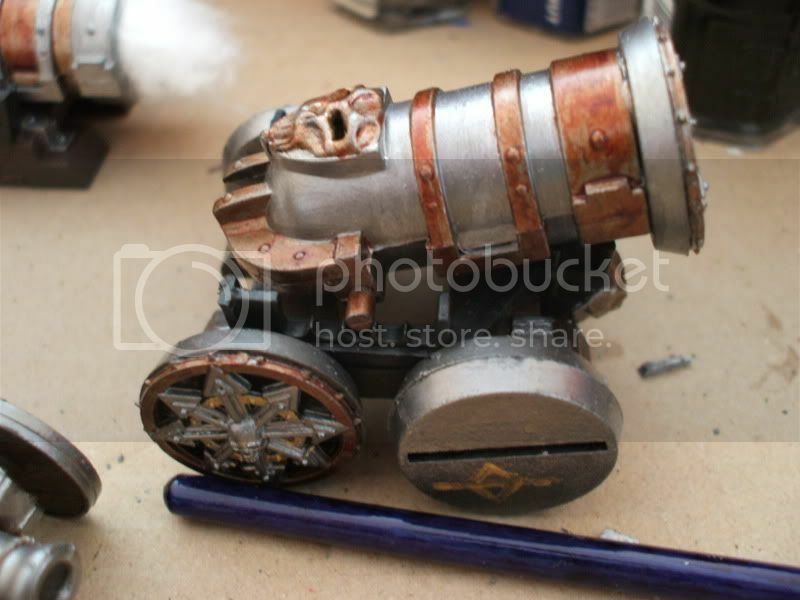 I have another, new, Dwarf cannon that shall also fill that role (will get picks up sooner or later for that). 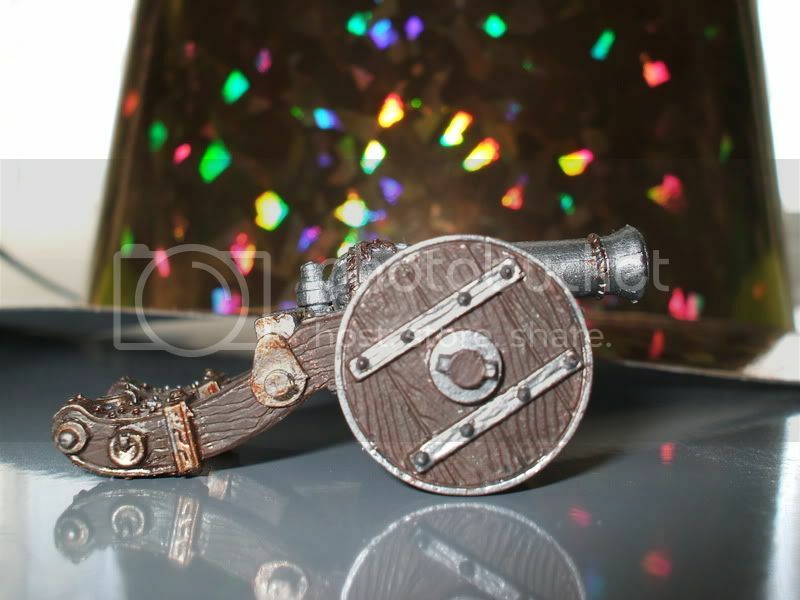 When used with Dwarfs, there are just cannons. With this, I simply painted it, following the scheme used with the other warmachines so far. 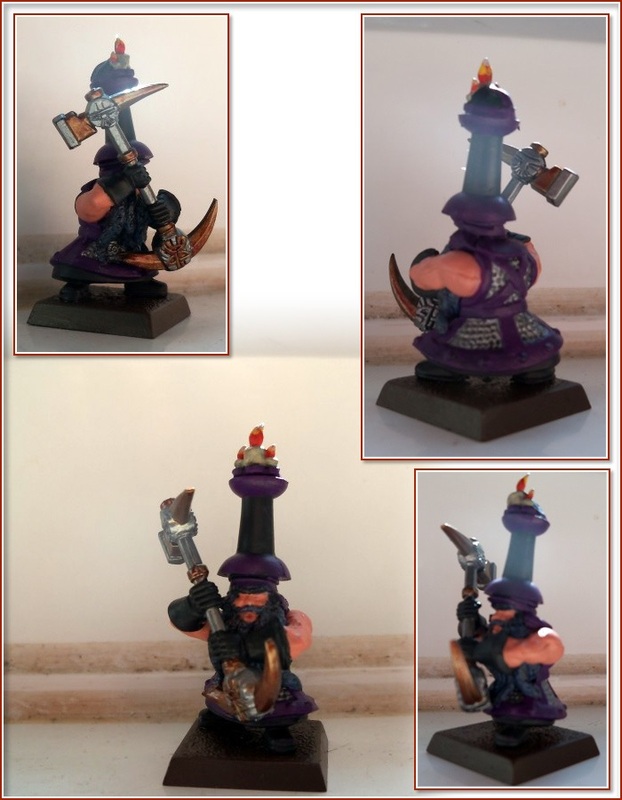 However, what IS noteworthy, is that it came with the three crew, one of which is part way to becoming a Chaos Dwarf Sorcerer! Oh, yes! 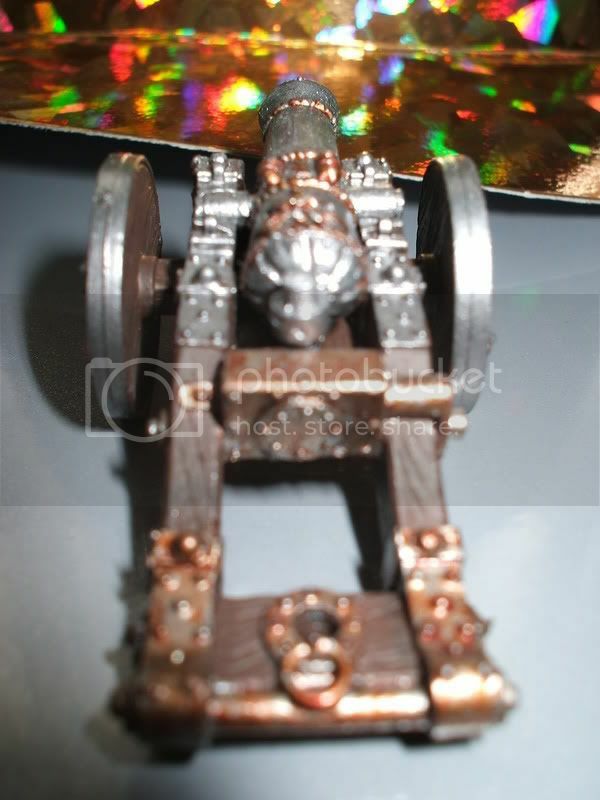 A CD Sorcerer made from a crewman. It's the model that is hefting a cannonball. All I did was remove his helmet, grab one of my BBs (I only have SEVEN! Was a little scared to do this...) and clipped his hat off. I glued it to the hatless crewman and now need some greenstuff to fill the MASSIVE hole in the back of his head and hat, replace a little lost hair and add flames to the cannonball to make it a ball of flame. It should be interesting to say the least because I have NEVER used GS before. I'll let ya see how it goes! As for the BB, he was rescued. 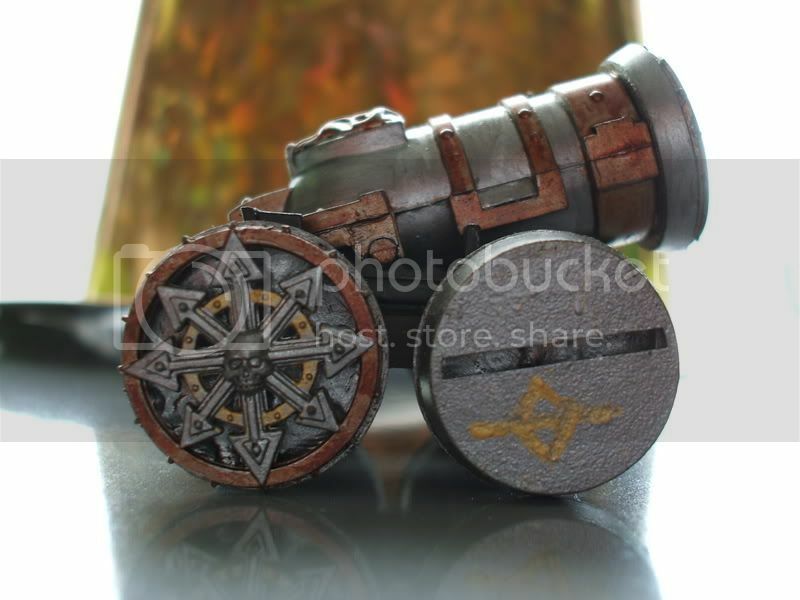 The Dwarf battalion box comes with cannon accessories, which, strangely, include a helmet, so I just glued that on. Almost no sign of a hat-swap! Any comments and/or ideas appreciated. That is all that I have painted that looks even REMOTELY CDish. Constructive criticism and comments please. I am also aware that my painting is not excellent. Not necessarily bad, just not excellent. P.S. 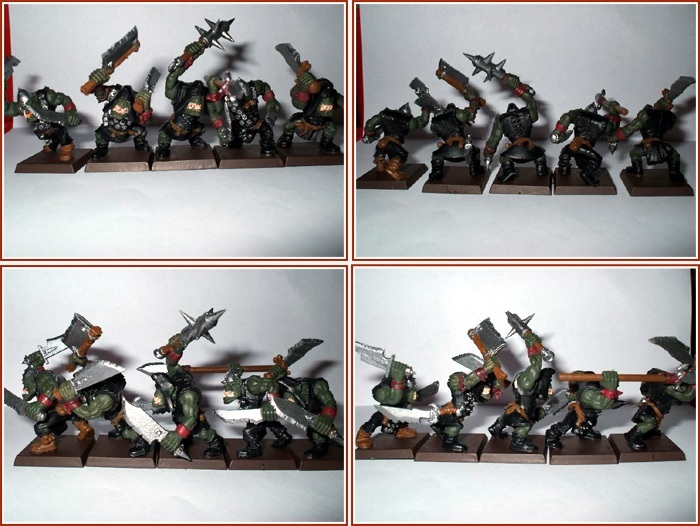 Should have some Orcs painted soon. 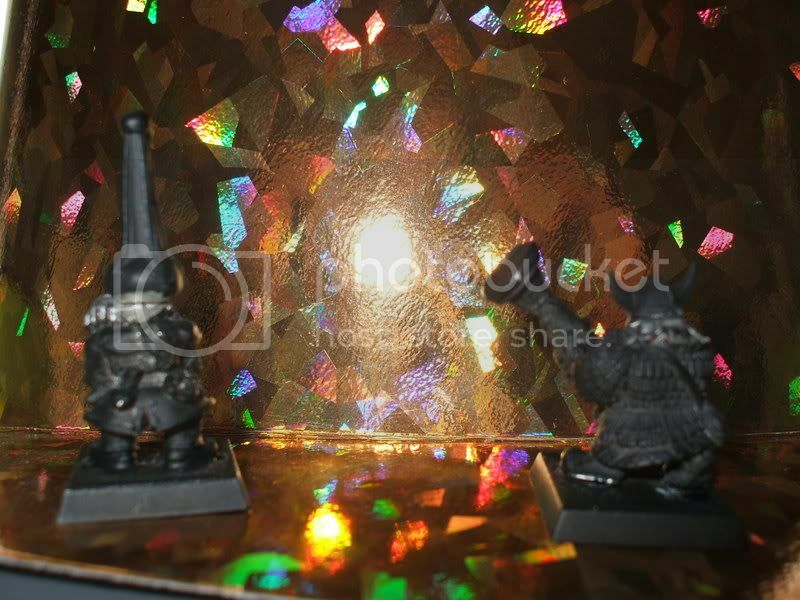 This post was last modified: 07-04-2008 10:24 PM by Hashut's Blessing. The Earthshakers turned out great! Awesome work! That skull is painted very nice, it looks awesomely evil! There's only one problem, and it's the front wheels... they just scream at me "40k bases!!!!" 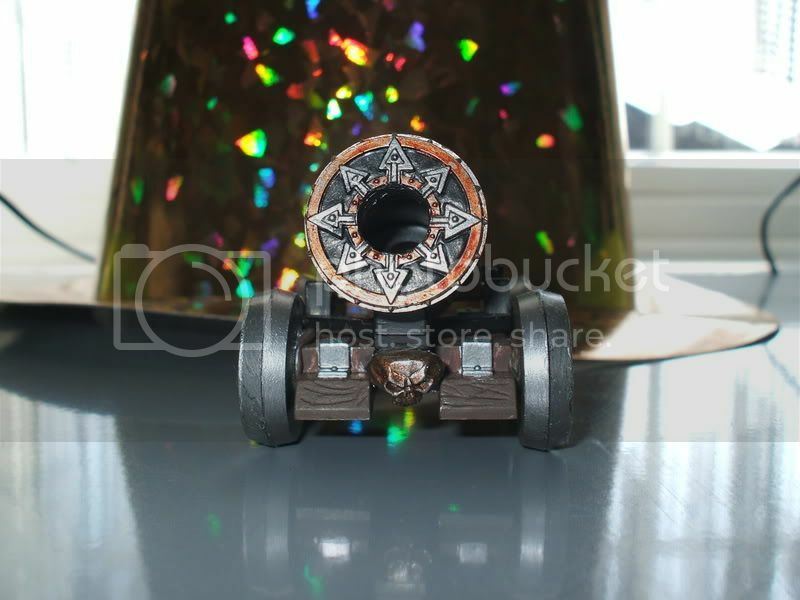 You have to change them... You could replace them with artillery wheels from anything (40k plastic ork artillery wheels are great), or you could buy my spare hellcannon wheels (bwahaha). They work fine, but the slots need to be covered up for sure! I prefer a darker, grittier approach towards the Chaos Dwarves, so the the shiny silver cannons and wheels are not really my thing. I'd apply some washes with thinned down black ink or armour wash and also some painted-on scratches and dirt marks to show these are actually used and have seen some action on the battlefield. I DID say I needed to change the front wheels, I have no idea what to do with them. I was going to put spikes on them as a sort of grip, but I also want a symbol (that doesn't scream Chaos cannon) on the wheels, which would cover up the unsightly gaps. 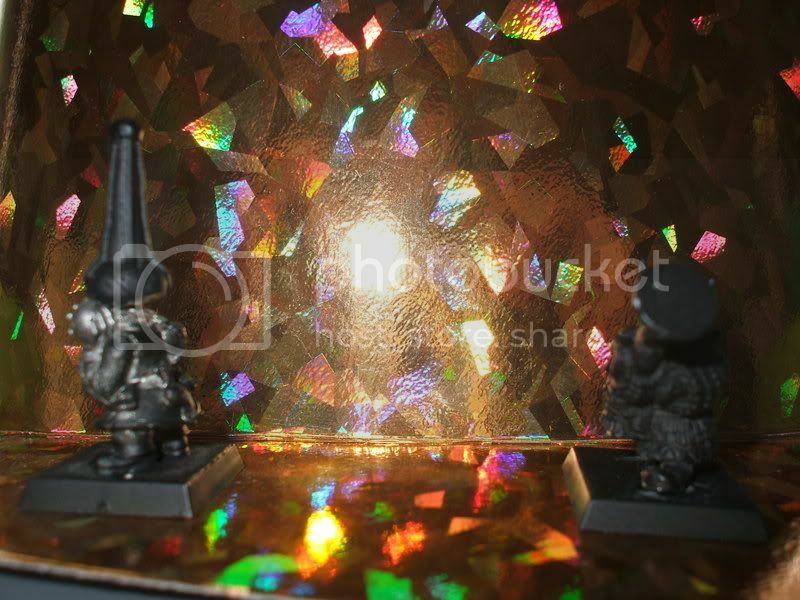 Ishkur Cinderhat, how would you paint scratches onto this then? Only, I am very basic at painting, I use no highlights or anything. Only recently started to use inks actually. 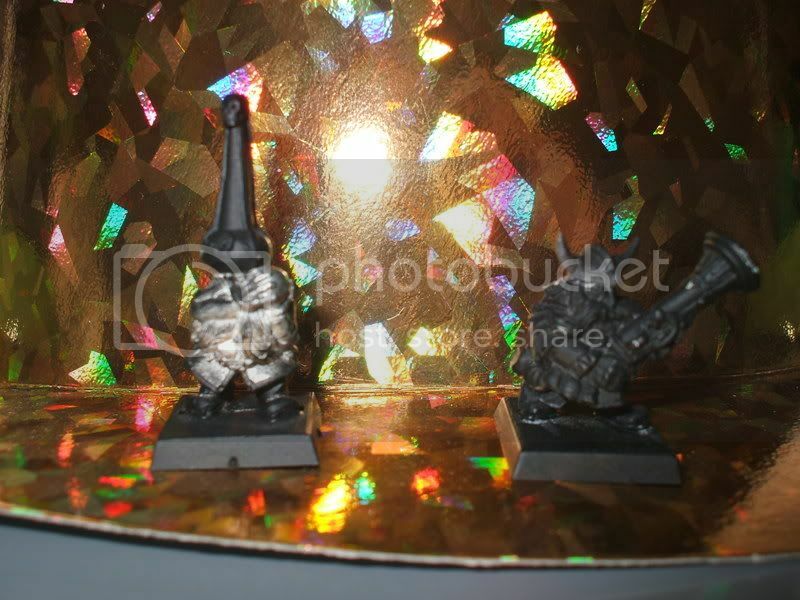 Also, the reason it's shiny is because currently I only have Dwarfs that are painted darkly as my CDs. (that are painted anyway) So I painted some cannons to fit in both with Dwarfs and CDs, but I had to keep continuity with the CD specific warmachines. I tried to make it darker by using a little balck on the frame, scorched brown for the wood and using chestnut ink on some of the areas. Like I said before, I was a little precarious as to hacking off the hat of a BB when I only have seven, but I think if I get the sculpting right, it'll have been worth it. I was referring to the GreenStuff skull. If you want to keep the shiny silver colour, then you could paint some scratches with black or a darker metallic colour such as boltgun metal. Mix away. Mixing works fine. Give your cannons a coat of slightly watered down black ink all over the silver bist and do the same with brown ink on the bronze, then goover the raised areas with the original colour leaving the inks showing in the recesses. In terms of highlighting, if you don't use it, vehicles and artillery are great places to start as they have such large surface areas. Mix a little chainmail or mithril silver in with your metalics and use the same tip as above, this time covering only the raised areas. 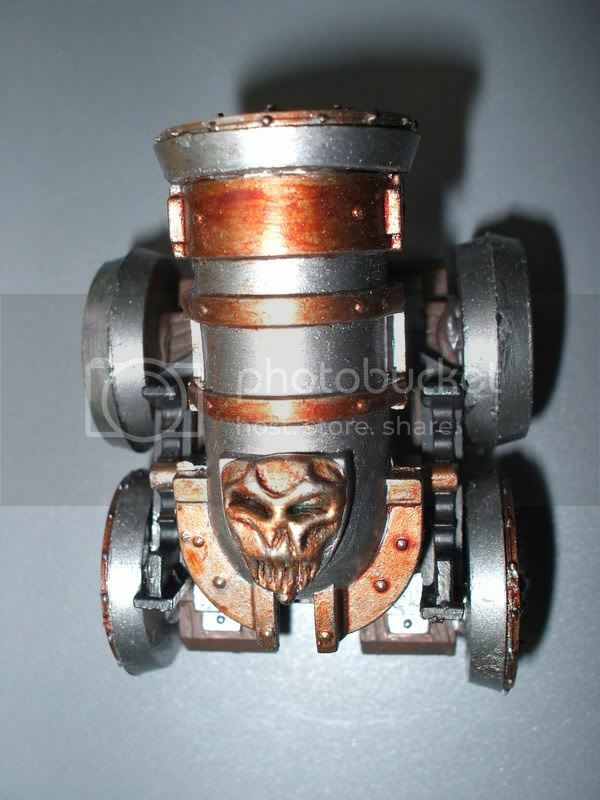 Black and Boltgun metal gives you a very dark metalic colour ideal for CD iron. For the scratches, I would paint tin bitz as a base and then a thin line of boltgun inbetween, but I don't really think they are necessary on these models. 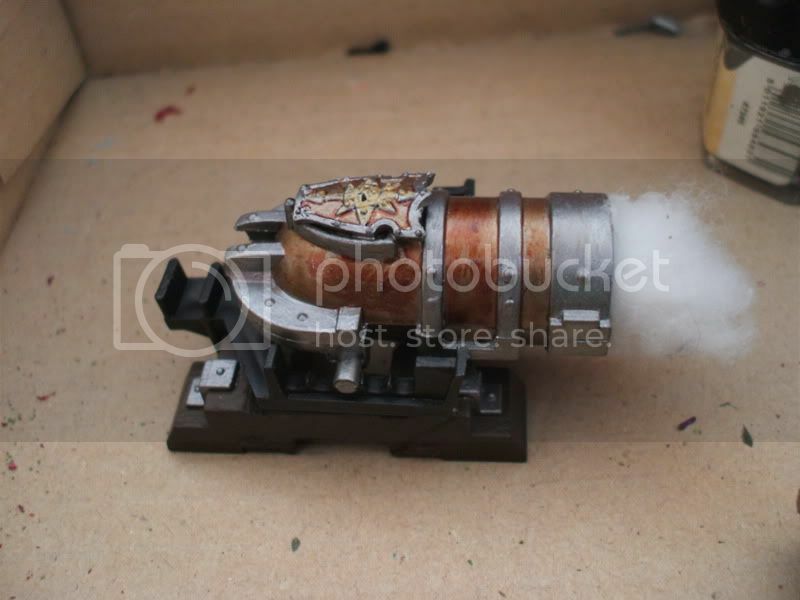 Instead, if you want them to lok used, drybrush scorched brown around the 'mouth' of the cannon, with a second drybrush of chaos black right at the very tip of the cannon. He he he. Thanks for all of the tips AGPO. I have some random Saurus warriors lying around, I'll try out highlighting on those before I do on the models I use. The thing is, this IS the limits of my painting capabilities right now. 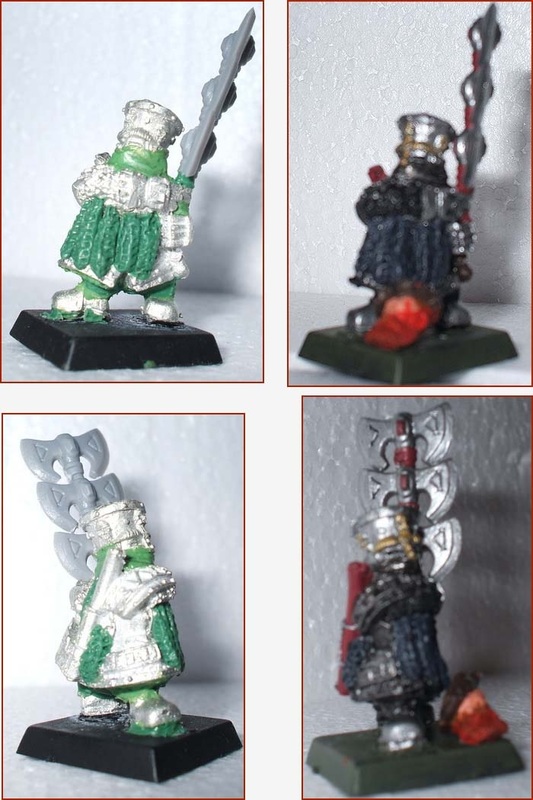 My characters previously have been only as good as, if not worse, than these models. 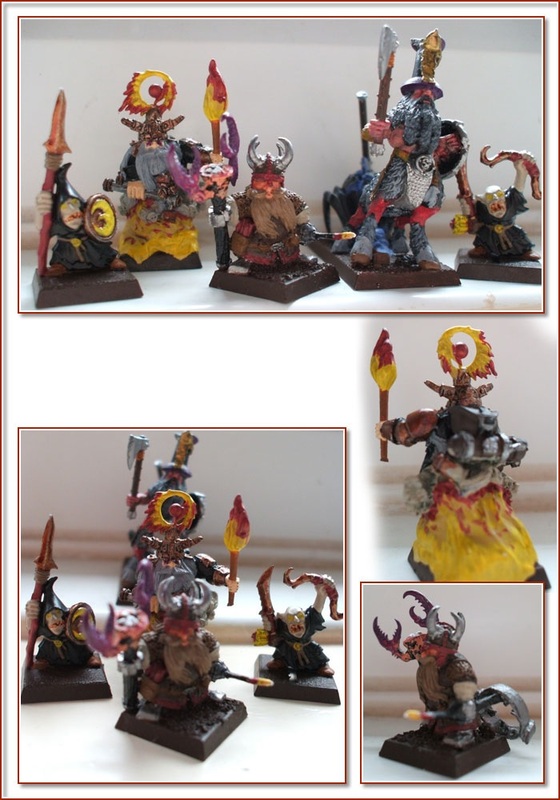 Although, I AM pleased with my Chaos tournament army. I have pulled off some quite cool paintjobs there. 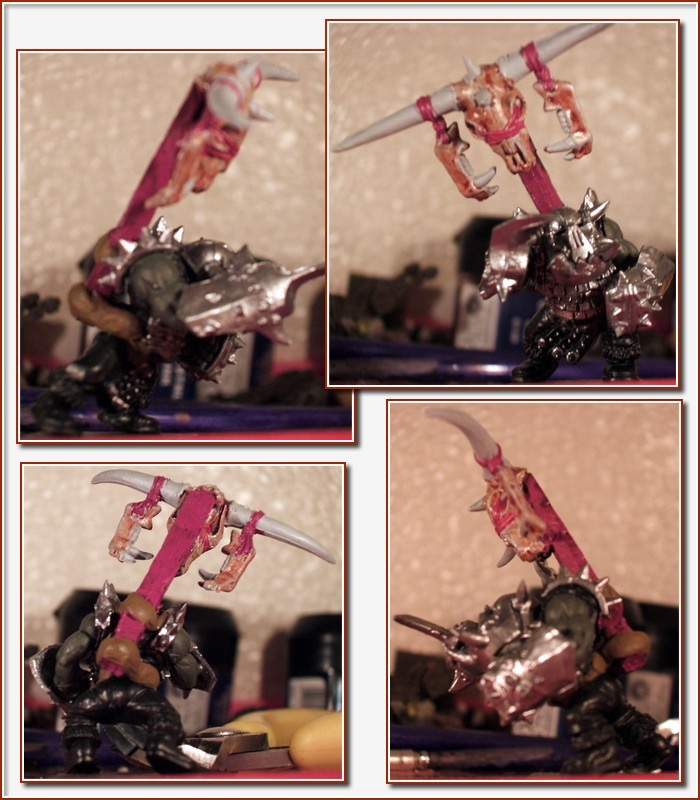 Thing is though, I think my models are of a decent tabletop quality as is. 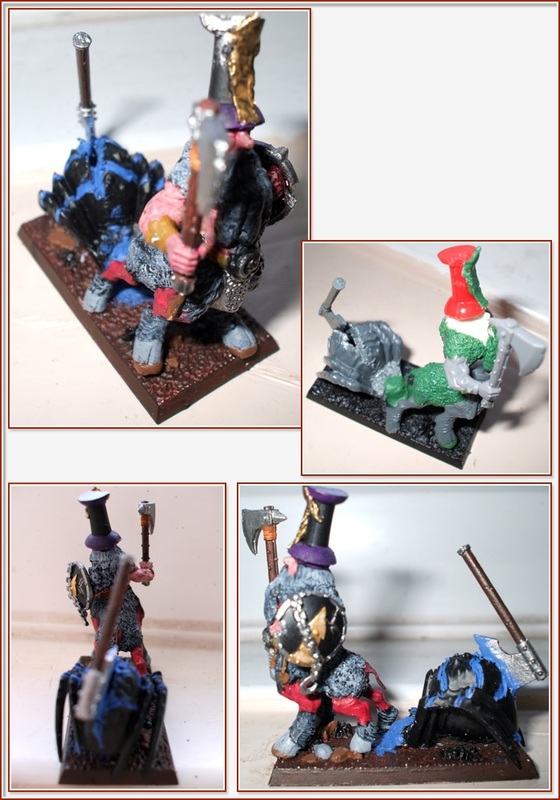 ESPECIALLY compared to my original painted models. But, as I said, I'll practise on the lizzies and then try it on these dudes. Desperately want some more BBs so that I can make a regiment of them. That'd look quite cool painted up. The warmachines will actually stand out quite a bit in my army because they will looks slightly lighter than most of it. Thanks again and I'll keep ya updated on the progress! Hashuts Blessing heres how you can scult flames. Hey I dident say I'd teach you. This post was last modified: 05-20-2007 11:11 AM by hobblin. Well, the stint of that work is long over, but univeristy has been a little hectic so far. I've managed only to paint most of one more model. Hmmm.... Progress is slow. I must remember to take pictures soon! Someone remind me to in a few days time if I still haven't! i also use black ink washes to get darker shades out of boltgun metal. great work so far liking it. to be honest all id do with the front wheels is fill the gap with putty and paint over it.